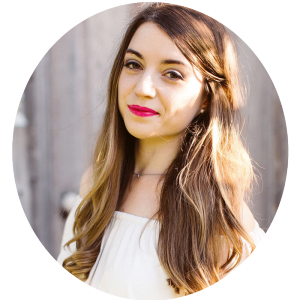 From Lauren: This recipe is from a fellow Nutritional Therapy Practitioner, Michelle Hoover, who regularly contributes her Autoimmune Paleo-friendly recipes here. Pasta salad is one of my all-time favorite summer-time side dishes. Fresh flavors, a yummy sauce, and a forever crowd pleaser… what more could you want? It’s amazing at summer cookouts, or even just an easy weeknight side dish, but not all pasta salads are created equal. The pasta salad that I grew up with was made from white pasta, mystery mayonnaise, and flavor packets filled with fillers and MSG. No thanks! 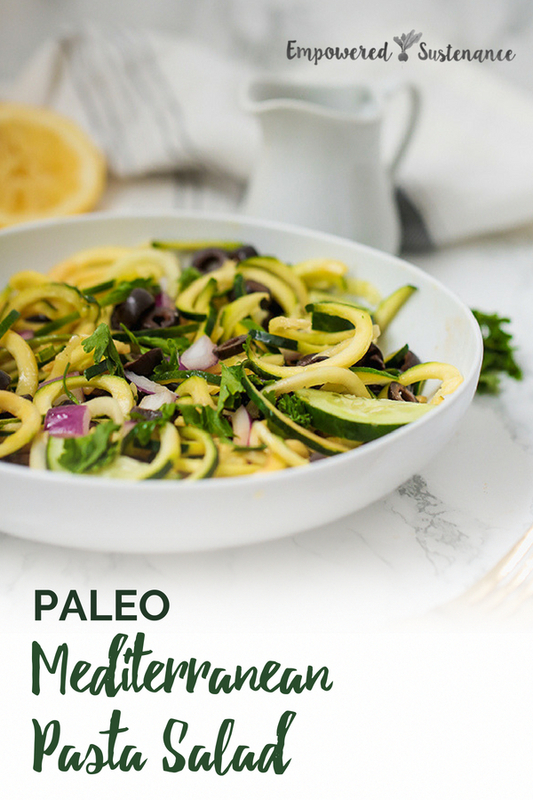 This paleo mediterranean pasta salad is grain free, dairy free, made from fresh vegetables, and it’s even autoimmune protocol compliant. It’s perfect for satisfying that nostalgic craving for pasta salad without risking feeling like junk. 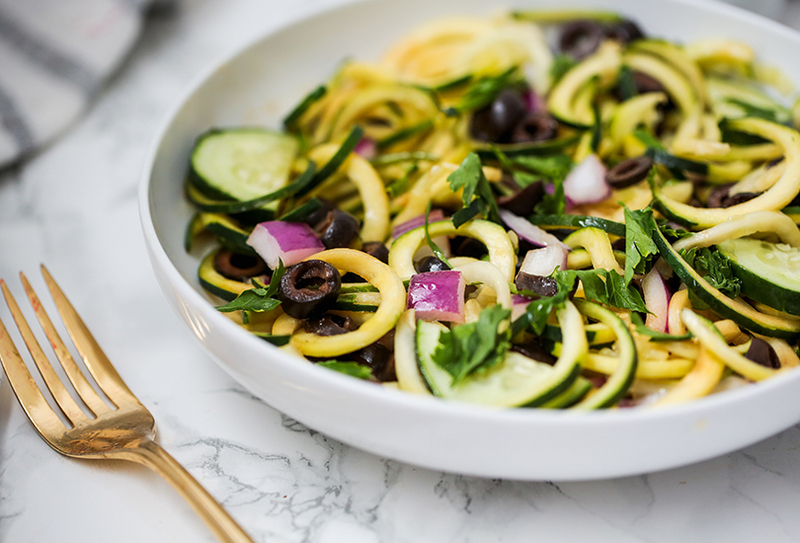 Zucchini noodles – You can either use a spiralizer to make zucchini noodles, or buy them pre-spiralized from a grocery story. Red onions- I love using red onions is AIP recipes as they give a little bit of a spicy kick! Cucumber- These add some more freshness crunch. Parsley- Fresh herbs are always welcome! Olive oil, balsamic vinegar, and lemon- This makes up the dressing for the pasta salad. Using a large skillet, slow heat 1 tbsp of olive oil over low heat. Sauté the zucchini noodles for 2-3 minutes or until slightly softened. Remove from heat and allow to cool. 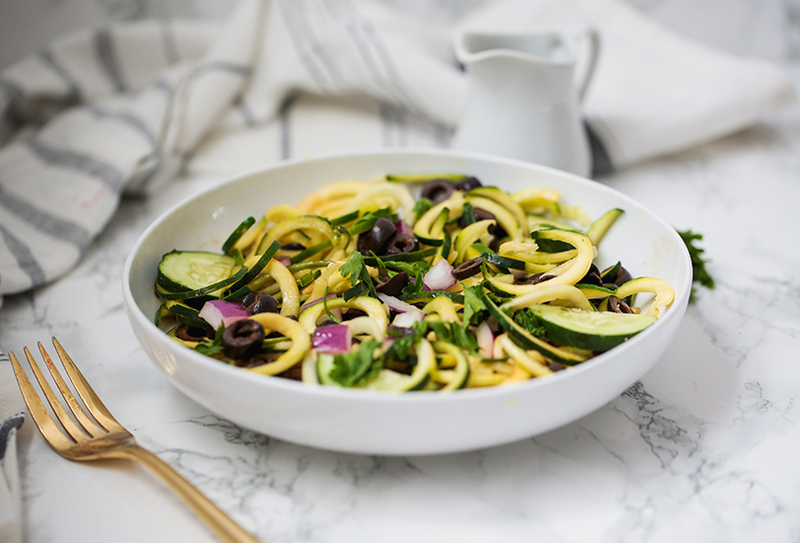 Add the cooled zucchini noodles to a large serving bowl and mix with the remainder of the salad ingredients. Prepare the dressing by whisking together the ingredients, and seasoning further to taste if desired. Pour the dressing over the pasta salad stir to combine.